The day finally arrives. 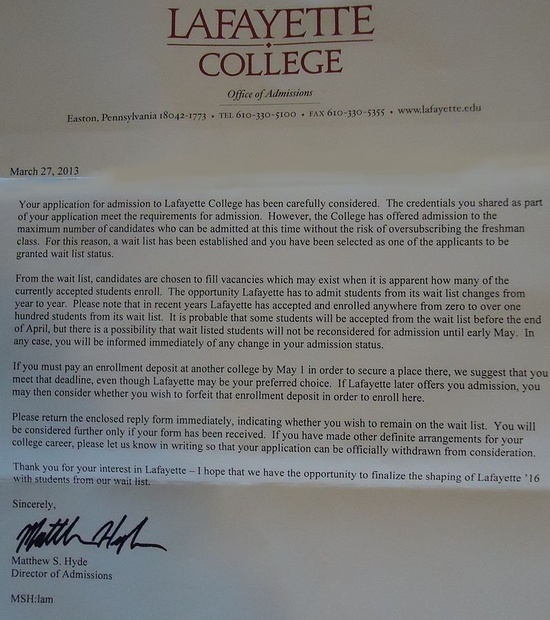 After months of waiting and years of preparation, you find out whether or not you got in to the school of your dreams. You then open the e-mail or letter only to find that your wait time has been further extended. You have been placed on the infamous waitlist, essentially telling you that the school likes you and wants to accept you, but perhaps there were better candidates or you were not a top priority. Some would argue that this is better than rejection. There’s still a chance, still a hope that your dream could come true. Many, however, feel that this is a worse scenario. Accepting your spot on the waitlist is like accepting your place in purgatory. With all the painful waiting already done, it would almost be more humane to just reject students flat out. Put them out of their misery. But this defeatist attitude doesn't get you anywhere. There’s no harm in accepting your spot in the waitlist. Why close that door before you know for sure what’s on the other side? Keep your options open. 1. First of all, you did not get rejected. If they really did not want or like you, they would have had no qualms about rejecting you. You almost made it. Sometimes a silver medal is more bitter than the bronze, but it’s still a step above on the podium. 3. Do not plan your future on that hope. Yes, there is a chance you’ll still get in, but statistically speaking, this is a small chance. You may accept your position on the waitlist and develop a plan of action, but in the meantime, celebrate the schools you did get into. You’re going to college. That’s a huge achievement that many of us take for granted, and is something that not everyone gets to say. 1. Write a letter to the admissions office, telling them that you remain hopeful and extremely interested in their school. Sell yourself again and include any updates on your life, academics, or extracurricular activities, since they last heard from you. 2. Make sure to keep your grades up. Strong academics never hurt anyone, and another positive point data point in your file will only help your case. 3. Have another recommendation written. Try to get this letter to show you from a different angle. If you had an English teacher and a history teacher write your first two letters of recommendation, get a math or science teacher to write this one. The waitlist can seem like the end of the world, but it’s not. It’s not even the end of the road, just the start of a different path.